2000 S, just hit 44k on the odometer. The top doesn't work right, the window is messed up, the thing that the top clamps too has an issue with the screws stripping out. I messed something up when doing a single-DIN install (preouts going to stock amp)... I didn't know about the wire that activates the immobilizer... but now that i've straightened that out, I can't get the car to lock properly and the keyfob just doesn't do anything (single beep if i lock by hand, no blinking red light on dash anymore... i'm not sure. My wing also isn't going up by itself right now. no idea what happened. the wing light comes on and stays on until i put the car into a forward gear and start moving. Needs ignition switch, i'll do it this week. So basically every little interior issue Boxsters have, I still need to take care of! Cosmetically it's super nice other than the back window. It just has some kind of exhaust on it. I'm not sure what it is, but it's deep and really subtle. I like it. Not too loud. My only plans right now are to get everything back to normal, I'm having a friend do a nice detail on it this week... Eventually I would like to get a set of wheels. I kind of like how those forgestar F14 wheels look, but I am still a little skeptical of them when it comes to quality. The car is a blast, having more fun without brutal acceleration that i'm used to... nice to just cruise and wear the tires out going around the corners. Never thought I'd like something with just 250hp THIS much! Got a great deal on it. Friend was moving across the country and offered me the car for slightly less than what a dealership was going to give him.... once i drove it, it was a no brainer! Looking forward to putting some more miles on it. I like to put miles on my cars. I don't like having the roof up, ever. I'm not sure how long the stock clutch typically holds up, but I intend on doing something to prevent IMS failure when i have to do the clutch. Maybe sooner. I feel like I'm kind of gambling by not just doing it, but also just don't have the desire to tear apart the car right now. One question (that i could probably look up) ... are there usually tell-tale signs that IMS failure is imminent or is it something that's usually just instant and catastrophic? In my ramble, i forgot to attach the picture. Welcome aboard! She looks nice. Beautiful color. I had the same issue with the dome light/header assembly being loose. I wound up putting two nutserts into the metal frame, now it is rock solid. The spoiler dash light is the correct behavior. It should come on and stay until you begin to move forward and then go out. How do you know it's not going up when you hit 70? I didn't think mine was working, but I used my video on my phone to chek it out. Basically got up to about 60 with th top down, hit record, held the phone up pointed it the rear deck and hot the accelerator. Sure enough when I hit 70 it came up. When I slowed it dropped. Welcome to our Boxster world. Like you I didn't know what I was missing all these years. Such fun cars! May I suggest at minimum a oil/filter replacement and cut away filter to chk for medal debri. You may also want to invest in a magnetic drain plug. Great looking car. 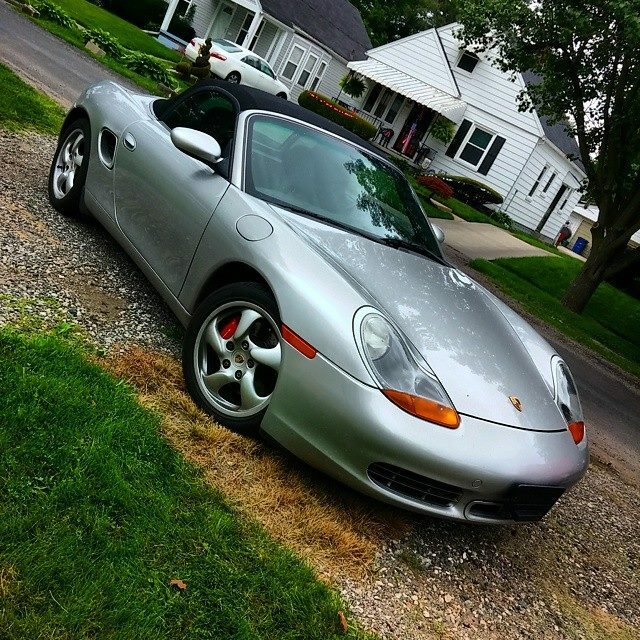 I have an 00 Boxster myself that I'm throwing a 5.3L in. Hopefully, I will be able to start it next week. I recommend putting as little money into the car as possible. Live with the little crap that bugs you but doesn't hamper safety. You'll never get anywhere near what you paid for it or what you'll put into it when you get rid of it. Which is why I wouldn't throw another $15k or more down the black hole to upgrade the motor to an LS if she blows. I'll sell it as a roller and get on with my life. It's a blast to drive if you have twisty roads nearby though. Absolutely perfect balance for twisties!!!!!!! And at 15 years old - what, if anything has been done to the suspension and motor mount? While the km's are low - time can still take a toll and again, the whole point of these cars is about how they drive. Up to date suspension and motor mounts can make a world of difference. Just a couple thoughts to add to your projects list. And don't forget to de-amber!! Refreshing the suspension and motor mount = $2500 or more, and that's just for parts!! Yeah, it's not cheap.....but it can (depending on current condition) make a big difference in how the car rides and drives. Very few things on these cars are cheap. But sometimes it's worth the money. Suspension to me is a big part of the car's handling and a suspension in good nick makes the car feel so much better. IMO. YMMV. On reading up, the 2000my don't seem to suffer IMS failure as much as later model cars. Which I hope is true as I have '00 S as well. Stealing the ashtray must be a "thing" mine was also taken. There are some ashtray delete kits out there that look good. I am about to find out... The car felt solid as can be most of last year, but I have noticed a little "shift" in the rear that I can only attribute to a failing mount. Other than that I am going to do all the usual tuneup crap soon, seeking out a new top and some misc parts... going to go over all the suspension components to see what's looking hot and what's looking not.. .The car was obviously well taken care of before I got it, but I have no records -- meaning I have to look at it as if nothing was ever done. This might be a wallet-burning spring, but I have been trying to prepare for it as best as possible. Going to be scouring the forums for all the little "projects"